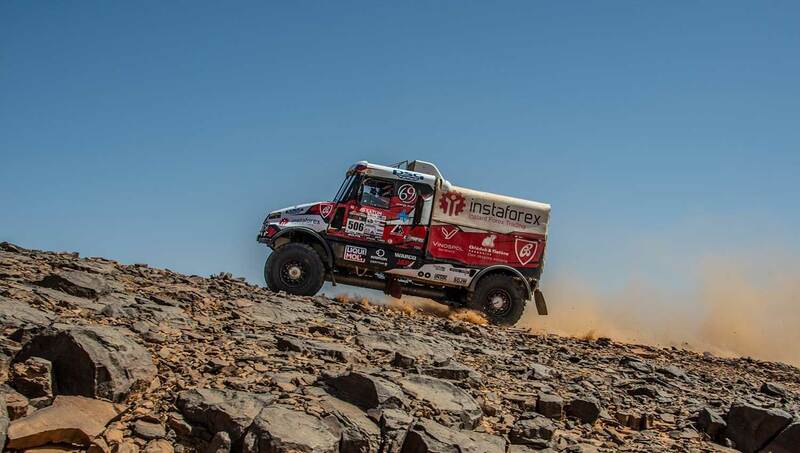 MKR-Renault Truck-pilot Janus van Kasteren reached the bivouac on Wednesday evening at an unusual low speed. A broken radiator slowed down the Mammoet Rallysport member and it was so bad that three mechanics had to work through the night to get the Renault back on the road. They finished just twenty minutes before the start on Thursday morning. Van Kasteren rewarded his mechanics with victory in the fifth stage on Thursday. Gert Huzink (MKR Renault), who also had problems and had to start even behind Van Kasteren, recorded the second fastest time. Both no longer play a role for the general classification. The lead remains with Ales Loprais (Tatra Prototype), who opened the gap on Martin van den Brink (MKR Renault) even further. "Wednesday the radiator broke and as well the head gasket," said Janus van Kssteren. "Replacing a head gasket is an almost impossible job, especially in the desert. According to the factory it is a sixteen hours job. The mechanics of MKR therefore tried first kitting but that didn’t work. So at 3am they started to replace the head gasket and they performed a miracle. Only twenty minutes before my start time (9.32 am) they finished the job and we quickly made a test drive. We were already waiting with our helmets on at the start." He continued: "The first 20 kilometers we drove carefully and kept a close eye on the temperature, but when all seemed to be OK we went full speed. We left this morning in 11th place, but we were able to keep up a good speed for the whole day and eventually could overtake a lot of cars and trucks. The truck was performing perfectly so this victory is really thanks to the mechanics. We could not even have started without them." 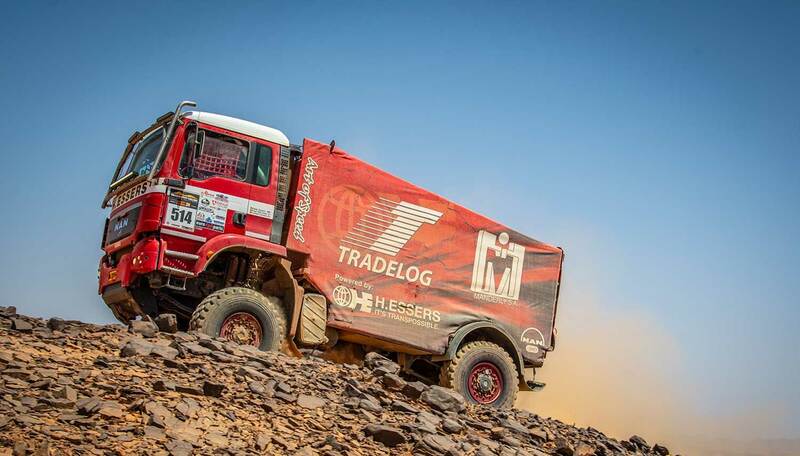 "Driving went super and navigator Erwin van den Bosch is getting to the speed. We gained most time in the last dunes here at Merzouga. I think we were the fastest in that section. The dunes were very difficult to read. You could not see any depth but they were very beautiful." 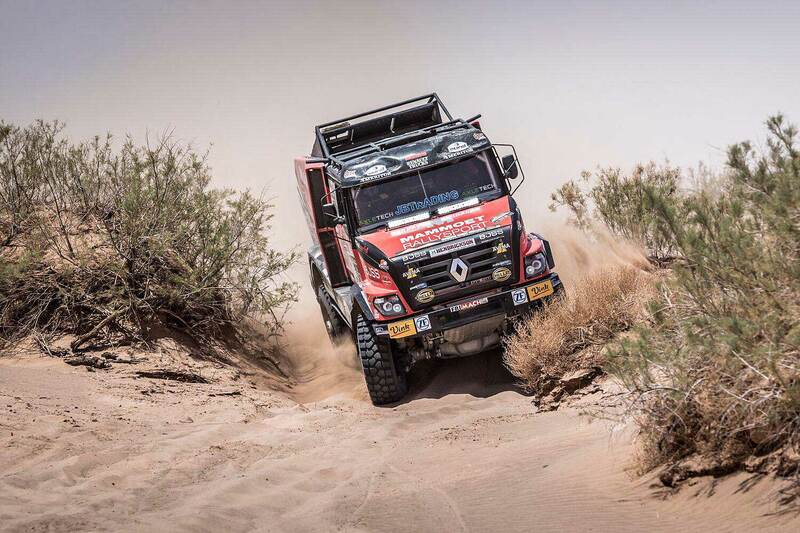 MKR-Renault Pilot Gert Huzink of the Riwald Dakar Team reported: "We lost time again due to cooling problems in the dunes - in the first series, the dunes of Ouzina - otherwise we would have won the stage. That almost took us half an hour. Wednesday we also lost two hours to repairs. The cooling fans are not working as they should and quickly the temperature of the engine reached 110° C degrees." He continued: "If you have to stand still every day you can forget the general classification. A stage victory is the only success that remains for us. But to achieve that everything has to be right and that, again, was not the case today. So with second place I'm actually not really happy at all. On the other hand, the dunes went very well." "If you do not run into troubles in the dunes here, you're fine. If you get stuck, you are likely to loose an hour at least. We almost got stuck once. Because the sand reflects the sun, you do not see any depth and it is difficult to understand the dunes. We took off even behind Janus, so we were in the dust all day and had to overtake many cars and trucks, but not everyone went aside when we pressed the sentinel to indicate that we wanted to pass by."